Amnesty International pleads: "NATO: Keep the progress going!" 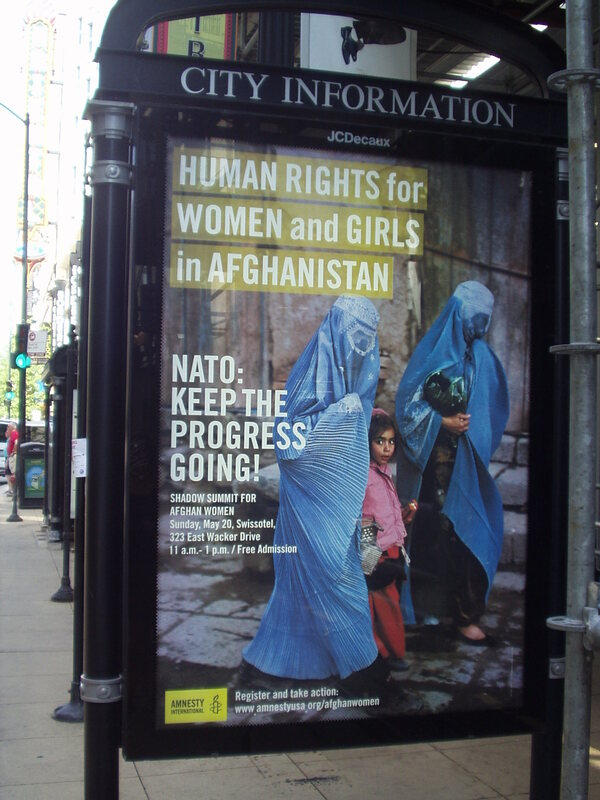 Amnesty was forced onto the back foot almost immediately by protests over its posters, which read “NATO: keep the progress going”. Many thought this appeared an endorsement of the occupation. Amnesty USA (as the US branch likes to be known) tried to redirect attention to what it said was its main aim: that the US and NATO should (in the words of Hillary Clinton) “not abandon women”. This was the theme of an article earlier in the year, when the group’s policy director Cristina Finch attacked NATO’s “peace talks” with the Taliban. The Amnesty argument was that NATO should "defend and extend" the women’s rights that have been achieved under 10 years of occupation. Amnesty staffer Jungwon Kim referred to “significant but tenuous gains Afghan women have made over the past decade”. This in turn linked back the Finch article, which suggested “modest advances in human rights for women and girls had been made in Afghanistan during the past ten years of US occupation”. These were said to be in the areas of girls in school, new laws against gender-based violence and a quota for women in parliament. Reference to the “struggle” does not hide the implication: that any gains were backed by a military occupation. There was no source for these claims, but they appear to come almost word for word from an article by Khorshied Samad posted on a Fox News site. Samad is Afghan born, a Washington-based “strategic affairs analyst” and her husband has been an Afghan diplomat under the Hamid Karzai regime. It seems more likely that Colucci copied Samad, than the other way around. I took a particular interest in Amnesty’s claim that maternal mortality has fallen under the occupation. I have studied maternal mortality and all the recent data put Afghanistan as the worst or equal worst on Earth. Was there any basis for the assertion that “maternal mortality and infant mortality have declined” under the occupation? Maternal mortality is undoubtedly an important indicator. As a key human development measure it has been listed country-wise since 1990 in the UNDP’s Human Development Reports. It is also included as the fifth of eight goals in the UN’s Millennium Development Goals (MDGs). The first part of MDG 5 is to reduce maternal mortality, the second part addresses the principal means of doing this, such as improving ante-natal care and ensuring the presence of a skilled assistant at birth. There is a “natural” rate of maternal mortality, suggested as about 1500 deaths per 100,000 pregnancies (one every 67 pregnancies). This is roughly the rate of deaths that occur when there is no skilled birth assistant, such as a midwife, doctor or a specialist nurse. These assistants can prevent most deaths that occur by bleeding, infection, shock and obstruction (Van Lerberghe and De Brouwere 2001). The worst outcomes in the world, rates of more than 1000, have been in Afghanistan and in several Sub-Saharan African countries: Chad, Guinea-Bisseau, Sierra Leone and Somalia. The UNDP (2012) notes that all countries have made some progress since 1990, but remain extremely high. Afghanistan began the worst, got no better under the Taliban, and remains the worst. The Amnesty (Finch) article refers to UNICEF data which lists Afghanistan’s maternal mortality rate (adjusted) at 1400: the worst in the world. So where is the "decline"? On the consensus of latest data available (I will come to the exception posed by WHO-World Bank data), it seems that Afghanistan remains the worst in the world, despite some slight improvements. The reasons for this are not too hard to see. The WHO reports Afghanistan as having the lowest levels of births attended by skilled assistants, among those five worst performing countries. Table 3 shows that only about one in seven Afghan women get such assistance, and that ante-natal care could not be calculated. None of the African countries had such poor levels of birth care. However a distinct data set, produced by the WHO along with the Washington-based World Bank and some US academics has challenged all that. If we are to believe these figures, Afghanistan has made the 25th best progress in reducing maternal mortality over 1990-2010, a period which covers both the Taliban administration and the US-NATO occupation. The rate is said to have fallen by 65%, from 1300 to 460. The most dramatic improvements are suggested as in the pre-Taliban (Northern Alliance period) and under the occupation. Afghanistan, according this data, has raced ahead of the African countries. But how credible is this WHO-World Bank report? So far, all the key UN agencies (UNDP, WHO and UNICEF) maintain Afghanistan’s rate at 1400, rather than 460. The WHO-World Bank team say they “consulted” with government teams from each country to adjust their data. They say that in many countries (including Afghanistan) where there was no good civil registry data, they had resort to “other” national data. There is no other specific explanation of how the Afghan data came to be revised down this far. The direct US government links (the US dominates the World Bank) are reason for concern over this study, as the legitimacy of the US military occupation in Afghanistan now depends significantly on claims (such as those made by Amnesty USA) that it is delivering benefits to Afghan women. Given this conflict of interest and the lack of particular explanation for the “fall”, I suggest that, until and unless the key UN agencies (WHO, UNDP, UNICEF) adopt this revised data, it should be treated with suspicion and set aside in favour of the UN-published data. That means that, despite some limited progress over the past two decades, the best data tells us that Afghanistan maintains the worst maternal mortality rate in the world (1400 per 100,000 pregnancies), a rate not very far from the “natural” rate. This data is corroborated by the extremely low levels of skilled assistance available to mothers at birth. The billions of dollars spent on a military occupation (and many thousands of deaths of person other than mothers) do not seem to have increased Afghanistan’s rural midwives and doctors.